They say that a picture tells 1000 words, but to spin that notion on it’s head, I put the call out on twitter yesterday to capture the essence of this image in just 140 characters in the form of an ode, a verse, a rhyme or a little ditty. And I was not disappointed. It is a snap during the third term of a match at St.Kilda City’s famous Peanut Farm Reserve, a venue I have myself graced more than once playing for the Western Storm in the mid-week Reclink competition. It’s fair to say that while there are worse surfaces getting about, it’s hardly a bowling green. So there you have it. Creativity reigned supreme. 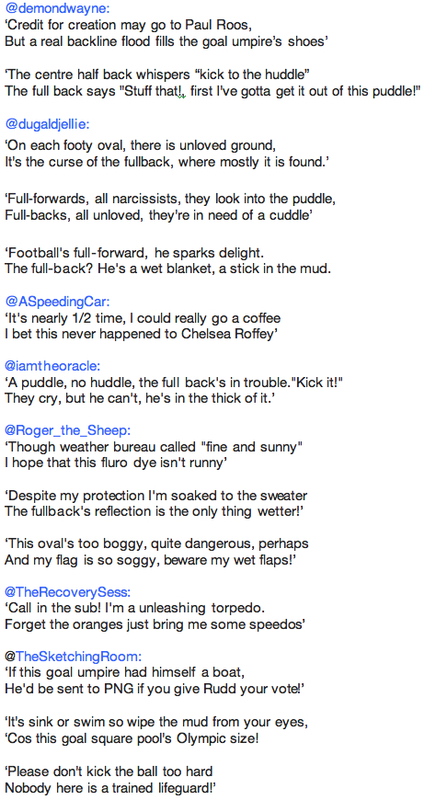 If I had to pick a winner, I think I’d have to split it between @ASpeedingCar’s Chelsea Roffey ditty and @TheRecoverySess’s torpedoes to speedos madness…purely because I chuckled aloud to those two entries. But they all kept me very entertained. We even dabbled in politics, a first on this sight I believe! If you feel inspired, please leave your own ditty/ode/poem in the comments section. 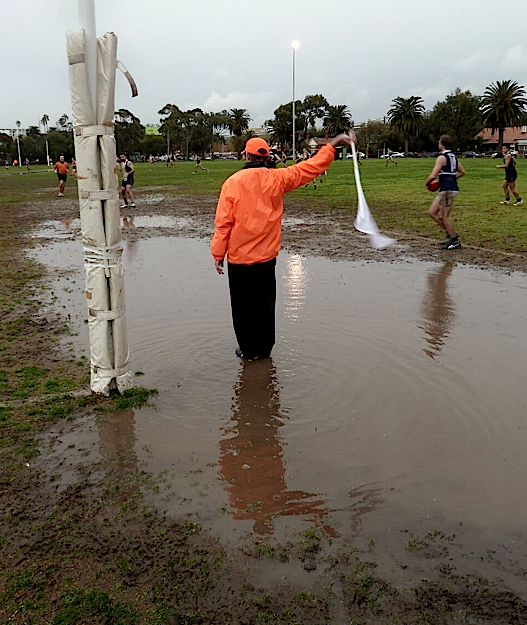 This entry was posted in Boots Happy Snaps, Musings and tagged cold, dark, flag, Footy, full back, full forward, goal umpire, kick, local, Melbourne, Peanut Farm Reserve, puddle, rain, st.kilda, VFL Park, wet by theholyboot. Bookmark the permalink. 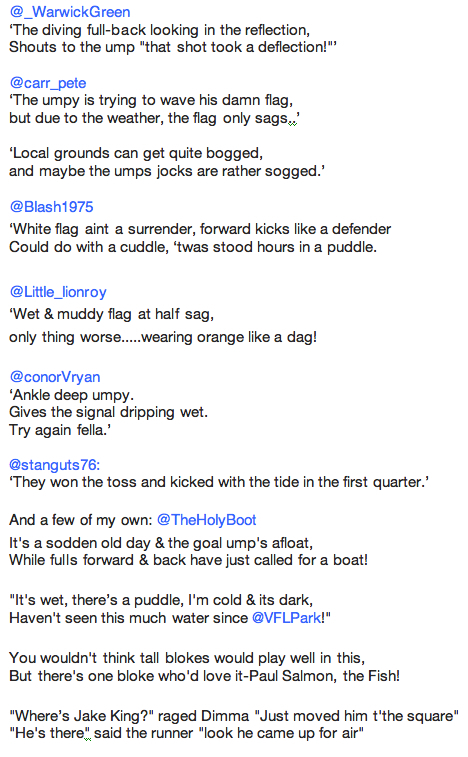 Holy (wet) Boot, what a hoot. Was Dugald Jellie wearing wellies?